Willson and Mat painting with one of the older boys. 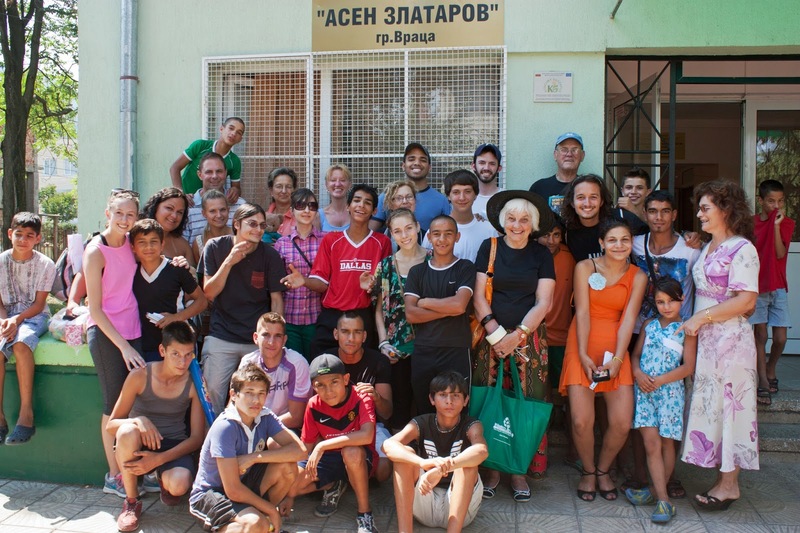 In July, 14 volunteers traveled to Vratsa, Bulgaria, with Humanitarian Travel Abroad to teach, play and paint at Assen Zlatarov, a social home for 70 children aged 7 to 18 whose families are unable to provide for them. Arranged along with Tabitha Foundation, we want to thank all of the people who donated through Fundrazr. Without your support, we could never have repaired and painted as much as we did: five rooms and a common area. Our volunteers, all from Connecticut, ranged in age from 15 to 74. There were college students from WCSU and the University of Connecticut, a lawyer, a social worker, university professors, a UPS driver, an IT specialist, a nursing student, and a kid in high school. A special thanks to all of you! Our oldest volunteer was very moved by the home as his own half-brother was raised in an orphanage in the US. In fact, a Bulgarian colleague insisted that there were no more orphanages in Bulgaria when I told her of our project. She was quite shocked to learn that indeed they do exist. While the children are safe and cared for, they still live in an institution with scheduled meals and play time. The children must be let in and out of the building and younger children leave the grounds only on prearranged outings. There is a stigma associated with orphanage living, and the children do not attend the nearby school but are bussed to another one. A high percentage of the children are Roma, known more commonly outside the region as Gypsies. The Roma constitute a minority population in Bulgaria and many families live in poverty. Many other children at the orphanage have developmental disabilities - one girl could not speak. As this is not a home designed for children with special needs, they receive no therapeutic assistance. Our volunteers socialized much with the children. This one-on-one interaction with adults and others is an important aspect of learning and growth that is difficult to provide in an institutional setting. Keeping the children stimulated is even harder when school is not in session. In addition, it is very hot in the summer. Children are kept indoors on particularly steamy afternoons for their health. Mainly, they watch television. Turkish soap operas and music videos are popular choices, and these are not always age appropriate for the younger viewers. The volunteers used their various talents: a social worker spoke on childhood development; a teacher provided lessons on literacy; our senior team members, a lawyer and a retired teacher, directed the younger and more inexperienced painters so that the colors were properly applied. This included many of the older boys from the home who were able to assist in sprucing up their bedrooms. 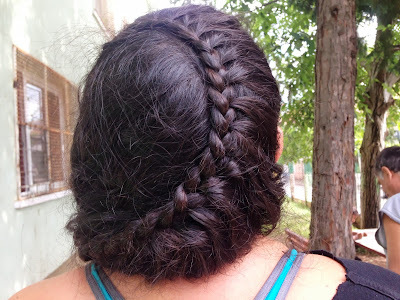 Other volunteers interacted with the kids, paying sports, learning new dances and having our hair braided. Each day we ate lunch with the children, usually a soup, main course and watermelon. The children seem to easily share with others in the lunch room any portions of their meal left uneaten. The week ended with a talent show. The children read poems, showed off their dance moves (formal and improvised) and soccer skills, performed acrobatic hand stands and leaps up, over and around each other! The volunteers too got into the act, dancing, showing off comedic skills and laughing it up during the 'chicken dance.' Leaving was difficult amid the hugs and tears. My approach to volunteering is to remember that this is a shared learning experience. 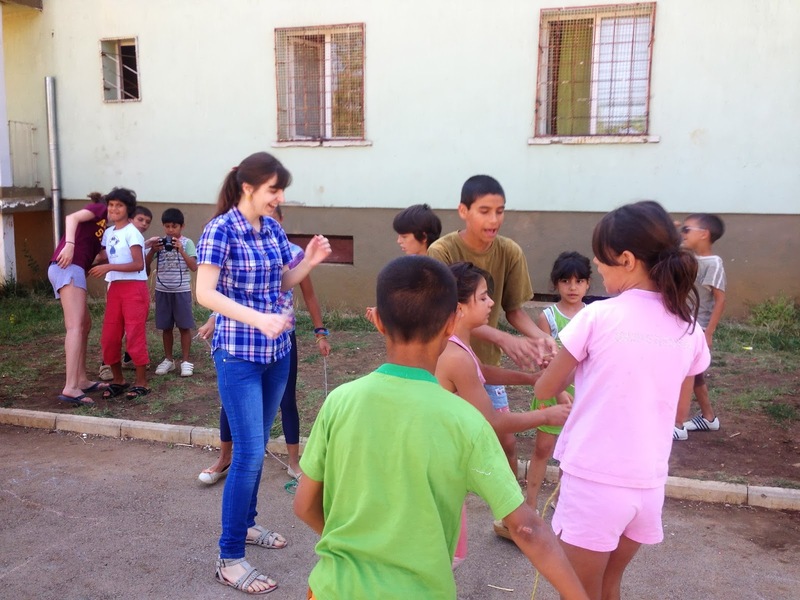 We brought home new cultural, political and social knowledge of Bulgarian orphanages, of volunteering, and of completing a project in a timely and professional manner with people you've just met! All while adjusting to new food, a Cyrillic language and what seems like 'oppositional' non-verbal communication: Bulgarians shake their heads side-to-side to indicate 'yes,' a constant source of miscommunication for Americans who read that motion as 'no!' We were aided immensely by two college-age Bulgarian interpreters. Thank you so very much to Martin and Assya - we hope to see you next year! Here is our group posing in front of the home with some of the kids. More photos follow. For more information about our trip please email humanitariantravelabroad@gmail.com. 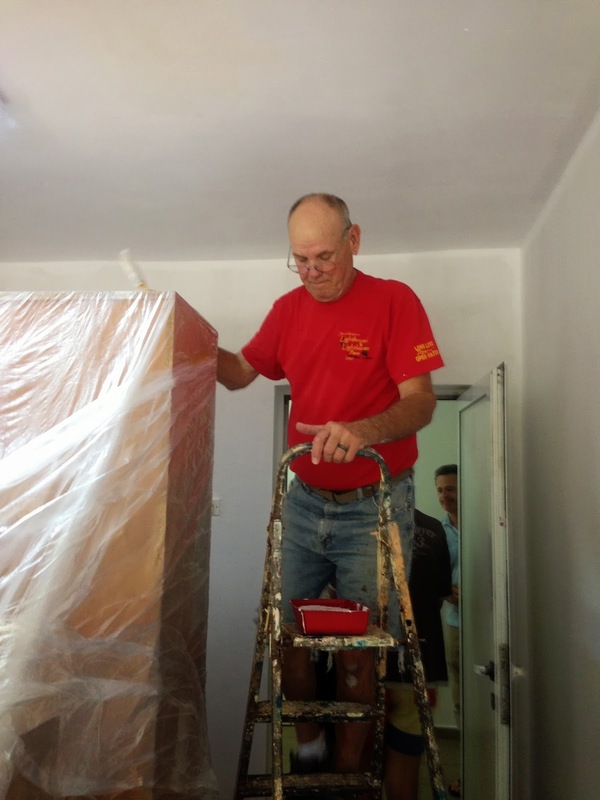 Our senior volunteers: Ben on the ladder and David peaking out in the back. Everybody and Erica pitching in. David and Gary with older boys helping in the back.